of Sabre 42 GATSBY, made a delicious dinner on board…. We feel at home in Vero Beach City Marina because we always see so many cruising friends here. The city has created one of the best cruising stops on the entire east coast. There are plenty of mooring balls with a great marina, fuel dock and a nice laundry and bathhouse. The boaters’ lounge has a TV, computer desk and book exchange, plus the city provides free bus service every hour to and from town! The ocean beach is only 4 blocks to the east and there are bike and walking paths throughout the parks, marinas and town. What is there not to like about a stop in Vero Beach City Marina? NOTHING! This place has a nickname among the boating community and that is “Velcro Beach” because we all tend to pull in here for a day or two and then we stay and some never leave. They get stuck, if you call this stuck. We happily spent the winter of 2007-08 here on our boat while working on new Masters’ degrees in Education from Drexel University. We set up a Verizon Broadband network and two laptops and processed 45 graduate credits from the boat! That was exciting and very challenging. So, returning here year after year is wonderful. We really like Vero Beach! Radeen posted a sign….why not have happy hour on a Monday? There is one every Thursday, too. Thank you, Steve, for the Champagne for mimosas…. 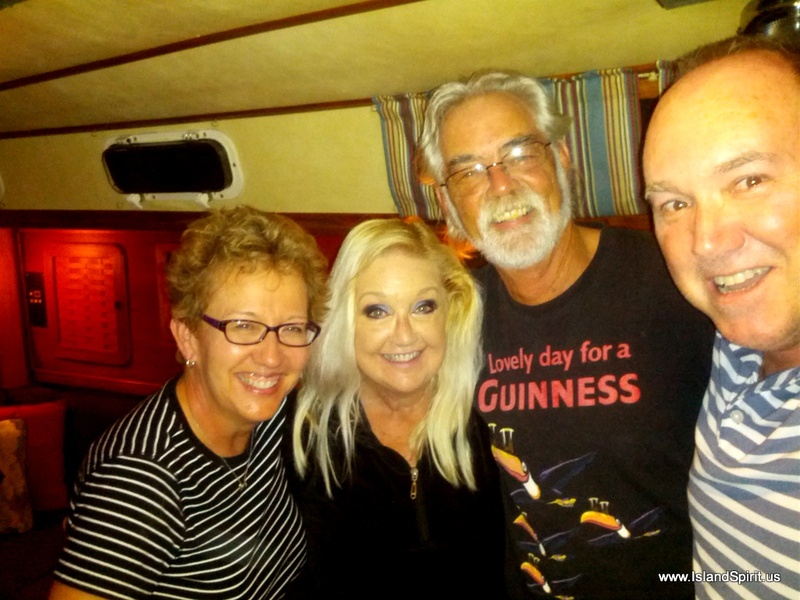 Spending nights at sea on a sailboat is a special aspect of cruising. It is also challenging, exciting, boring, beautiful, and very tiring. So why do it? We set sail for sea to cover longer distances in shorter periods of time. Then again, there are some trips where you must spend nights at sea. Running the East Coast to the Caribbean can take 10 to 15 days and nights! Cape May NJ to Block Island is a 36 hour run that takes one overnight. That is a summer trip we have made ten times. Sailing from Acadia Maine to the Cape Cod Canal is also one overnight trip. So, we do it because we want to get to the destination. We do it because we have a lot of confidence in our boat systems, fuel system and engine. If it breaks or stops running offshore, then we have to fix it. Lucky for us, our brand new engine, with 100 hours, ran perfectly. Hand built by a Bavarian, we now call it Yannie-New BMW, and it runs like one too. What a great engine. Thank you, Alfred, of Schooner Bay Marina, Wisconsin! We try to run watches at night so that we are each on in two hour shifts. That way the one off watch can catch some sleep. Sometimes we extend this to 3 hours, but we find we are so exhausted and tired that the one on night watch usually needs relived in two hours. Hayden usually does not sleep well and in this 52 hour trip, he only had 4-5 hours of sleep. While on watch, the person at the helm needs to be harnessed onto the boat so that they can not be lost overboard while the other person is asleep. No one is allowed to go onto deck unless the other person is up. No sail changes alone. If anything is not clear, like a ship crossing or a navigation issue, then get the other person up to help. Keep the boat moving, push 5-6 knots of speed with sail, or sail and motor to keep it going. We are not out here to extend the trip, we want to make a safe and speedy passage. Usually this means that if the wind is over 15 knots then we can use sails only. If it is 15 knots or less, then we add some engine to keep the speed up. 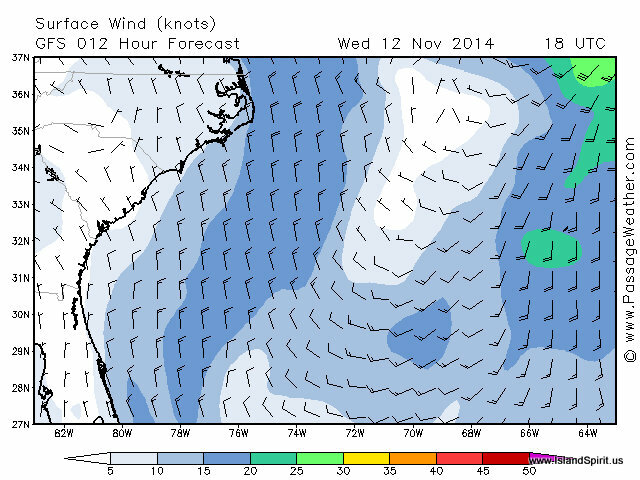 This trip was forecast to have 10-15 knots NW, but we had 0-10 SW winds. (See previous post for weather map proof!) On a course of 195 degrees, this required sails and engine at 2,000 to 2,300 rpms. On day two, the winds came in as planned and we had 15-20 NW. We finally killed the engine and sailed the final 9 hours! So here we are in FLORIDA. 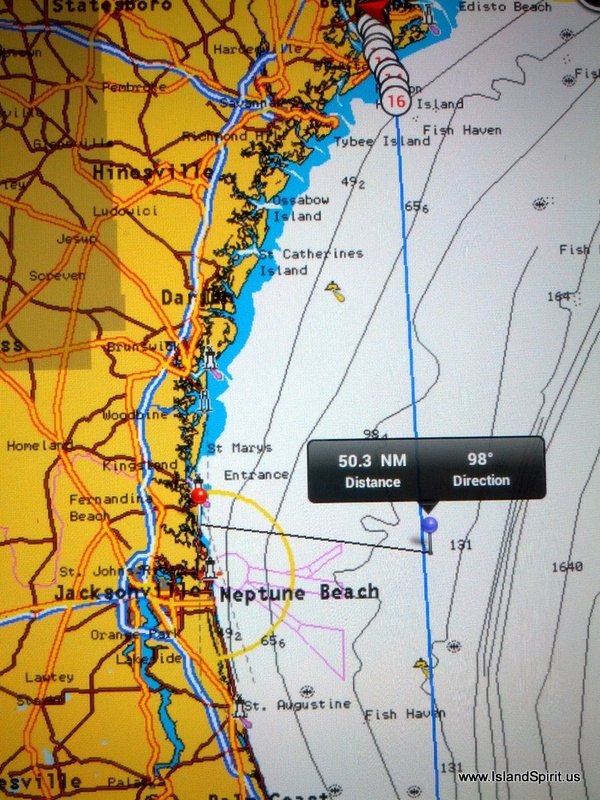 We are 964 nautical miles from Rock Hall, MD where we departed on October 8 for the Annapolis Boat Show, the beginning of our Fall 2014 cruise. We always have sails up in inlets in case our engine stops! Another view of the same sailboat and this 1,000 foot ship! We are so grateful to be on anchor, safe and secure in Fort Pierce. Now we can enjoy the Farmers’ Market and then move up to Vero Beach to see good friends and boat buddies. 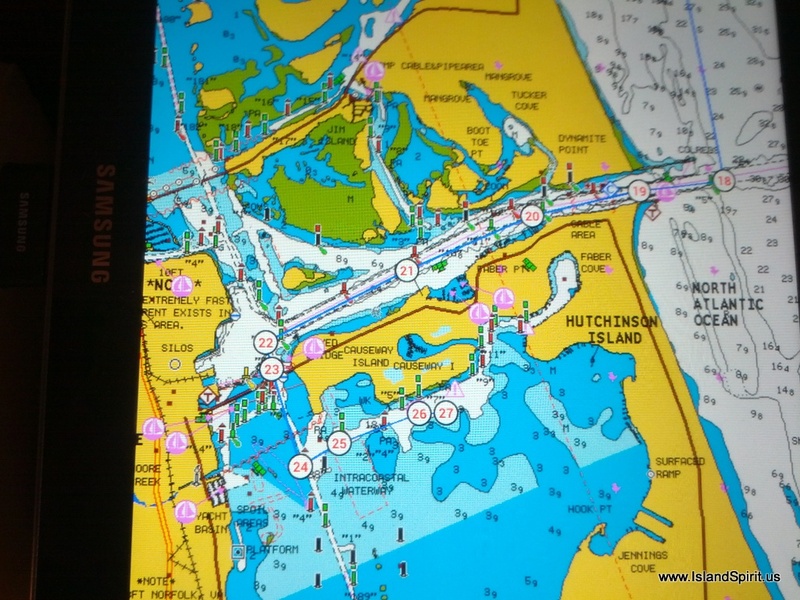 We will head to sea today, Nov 12, taking the ebb tide 22 nm out to the sea buoy from the wonderful town of Beaufort, SC. Again, that is Beuuuuuuuuuu-FORT, SC, not Bowwwwwwww-Fort, NC! We waited out the last north winds due to high and confused seas. Now, the low has pulled offshore and the waves are calming down to 2-4 feet from their 4-6-8 feet level over the past few days. 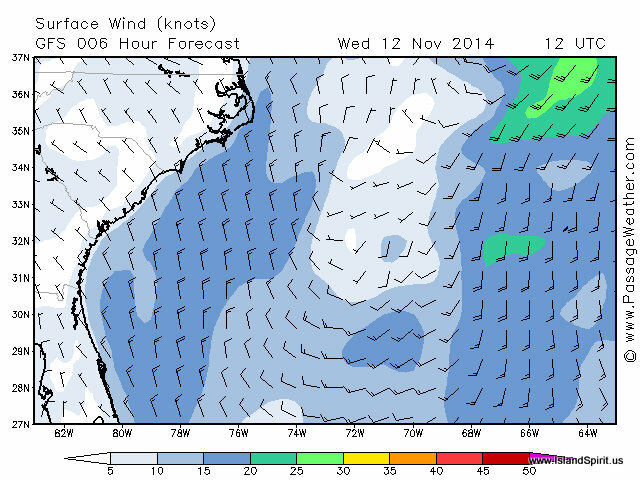 Of course, there is now less wind and it looks like it will be a motor sail for much of the leg. If you are interested in planning ocean routes and looking at sea state, pressure and winds, then we direct you to study up at www.PassageWeather.com. We find it very helpful to learn what we can expect when we get to sea. Thanks for following along. We will be pressing our SPOT at noon, 6pm and midnight and 6 am. This will show up on our SPOT maps HERE. We enjoyed low country lunch alfresco at Amen Street on East Bay. Cheers! Our days at Charleston South Carolina have drawn to a close, as our extended dockage stay ends today, Monday. We enjoyed our Rock Hall IP fleet buddies catchin up to us and they now have passed us as Captain Bill pushed on to Beaufort SC. While here, we enjoyed our time together with IP 31 Propromenon, IP 380 Blue Skies and IP 380 Tamarack and walks around town with these good friends. 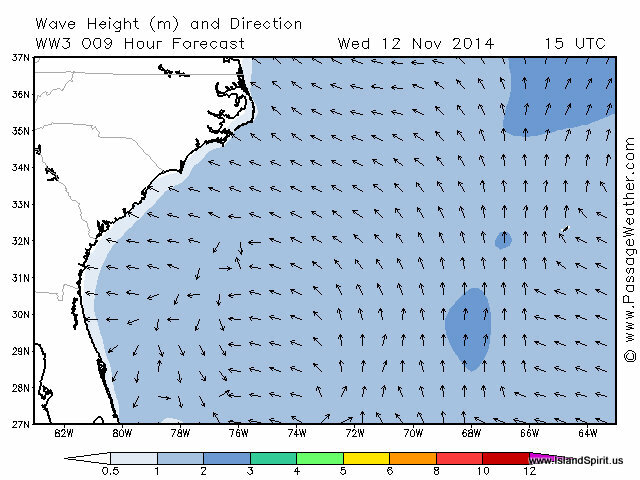 Our next plan is to get to Florida ASAP and that was to include heading out the inlet today, but with high waves, 5-6 feet, and a building low pressure with 25 knot winds gusting to 30, we will move down to Beaufort SC and head to sea from there. The waves are building to 2-3 meters! So, down the ICW to Beaufort, SC, that is pronounced Beauuuuuuu-Fort, SC, not to be confused with Beaufort, NC or Bowwwwwww-Fort. 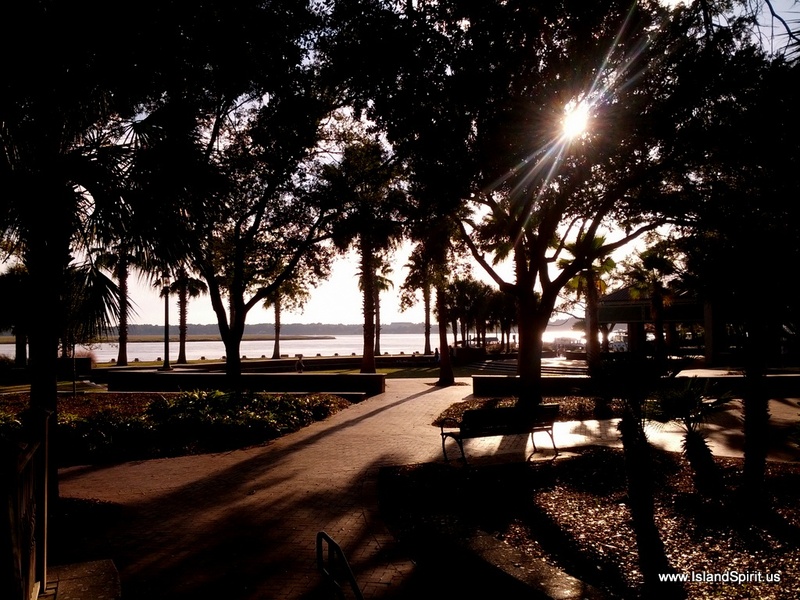 Charleston, South Carolina is always one of our most favorite stops on the AICW. 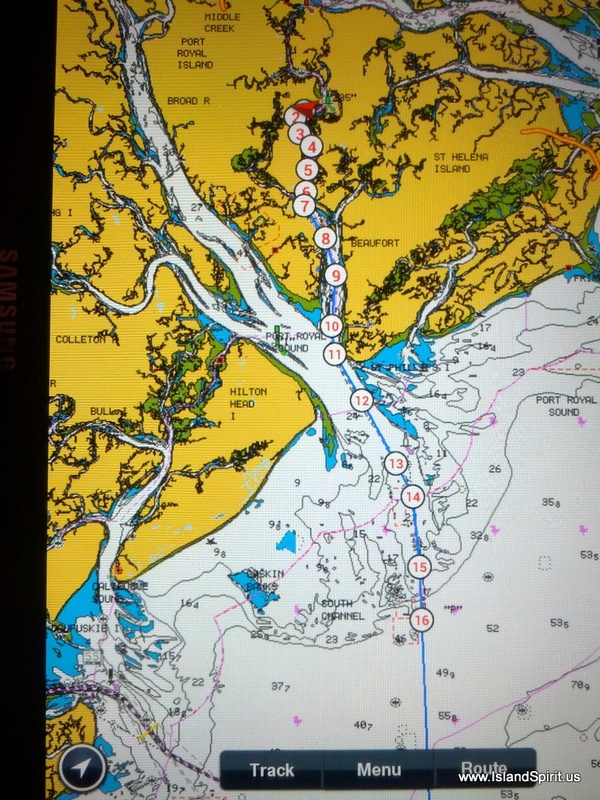 This time, for the first time, we departed Georgetown, SC, at high tide and ran the current out to sea. Exiting Winyah Bay between the submerged jetties with a 3 knot outflow against a 15 knot wind made steep 4 foot waves! Our boat was going vertical, then diving under waves like a submarine, then driving skyward like a rocket. Holding onto the wheel was a task and, lucky for us, it only lasted for a mile or two. 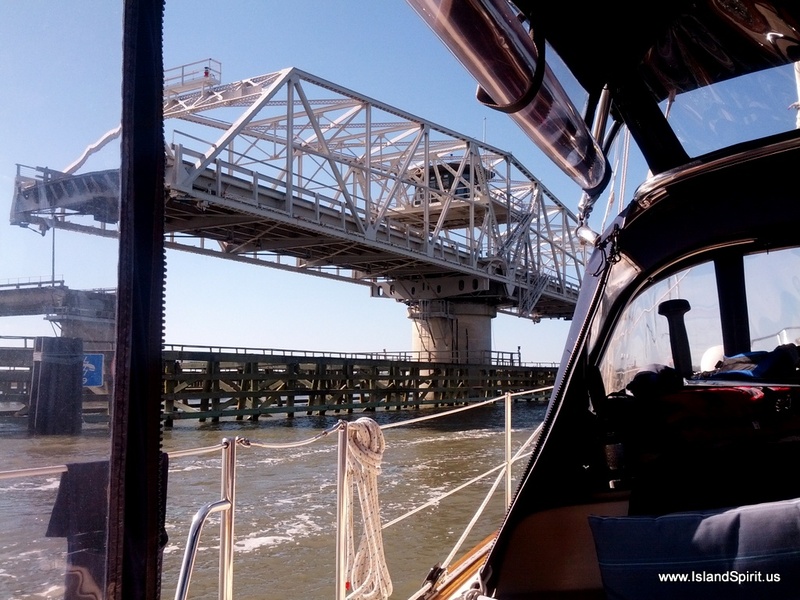 Once past the jetty, we turned south and headed out to the 30 foot deep water where the waves subsided and we could motor sail south to Charleston 68 nm miles away. At one point we were asking ourselves….WHAT THE HECK are WE DOING?…..as we did not foresee the current against wind situation. Our buddy Reuben aboard svPRIORITY, single handing, was harnessed in and hanging on and so was IP38 MOONDANCE. After a great ocean run, we turned into the Charleston Harbor and up to our favorite little spot, the Maritime Center at 10 Wharf Street. This location is so good because it is right off East Bay Street and very close to the Harris Teeter grocery store. With our team safely docked in Charleston, it was time to celebrate, as this was the first time Reuben on Buddy Boat IP380 PRIORITY had single handed such a long trip. Three weeks ago exactly, Reuben departed Baltimore by himself and ran with us for 630 nm to Charleston, SC! WOW, that is truly amazing and we are so proud of his accomplishment. Reuben is a fantastic man and we really enjoyed our time together. This was truly a time to celebrate with a bottle of Champagne and good snacks. Cruising is such a great life – it is more about the friends than the destinations that you reach. We really have great friends and we enjoy sharing this life together. From here, the team may be going in separate ways and at different times. Reuben will be having crew arriving Tuesday, Bruce Gregory of IP32 Morning Star. 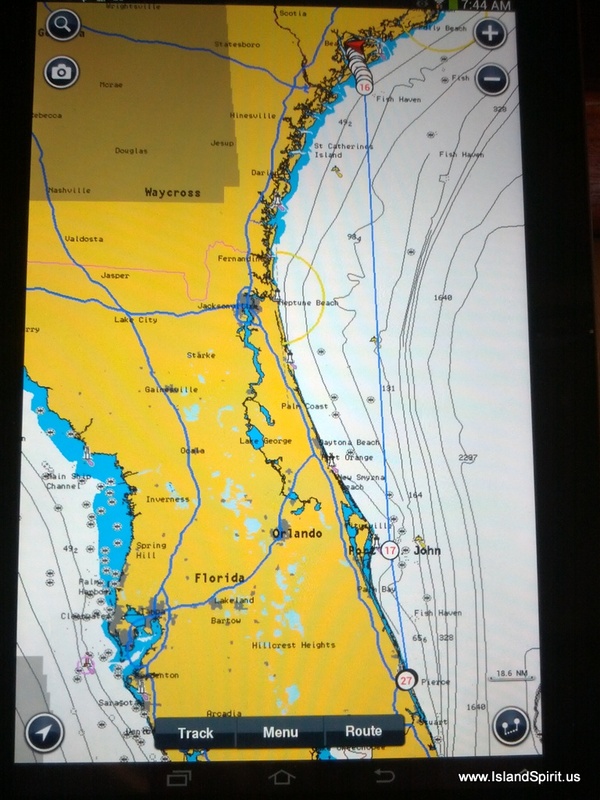 Moondance will be making a direct ocean run for Fort Pierce. Team Island Spirit extended our dockage until Monday as we have some other jobs to work on. For now, we will simply walk the town, enjoy the services, and tour the historic sites. There is nothing on the East Coast like Charleston, South Carolina. To arrive from sea makes it that much better. Fine dining for steaks and good red wine. Thank you, Reuben! The Arthur J.Ravenel, Jr, Bridge opened in July 2005. The HUNLEY was a Civil War submarine with a torpedo pole bomb! The action, East Bay Street is to the right. We are so drawn to cities and we really enjoy spending time in this one. For us, there is something interesting and unique about arriving at a city via boat. We are living this simple boating life style yet we have the conveniences of a city. For us, it really adds to the boating life. It takes 3 days to move 140 miles…. Three days of traveling 7 to 8 hours each day, covering only 40-50 miles a day, but moving each day and touring the towns, really does take up your time. It is amazing how busy we all are doing nothing but driving a sailboat south on the Intracoastal waterway. It is really fun, very easy, usually calm, and there is so much diverse beauty along the way that it is never boring. Just when you think it is all looking the same, up comes a bridge or a beautiful curve with interesting trees or the chaos of Myrtle Beach. Diversity is the key word that describes the AICW for us, and that is why we find it so interesting. Yes, it takes 30+ days of moving from Annapolis, MD to Miami, FL, but just imagine the variety we see along the coast. There are so many great waterfront towns and harbors that we are often sad to leave. But if we stay at every place we like, we will never reach Florida! The last three days cover from Wrightsville Beach, NC to SouthPort, NC to Myrtle Beach, SC to Georgetown, SC. Within this section there are beautiful beaches, fantastic seaport villages and chaotic Myrtle Beach with its mega houses on the waterway, mobile homes and billboards. 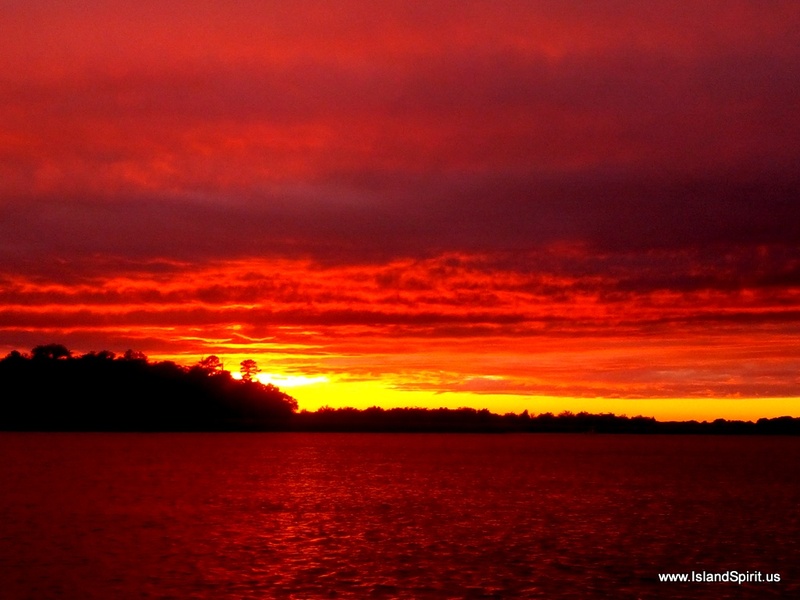 South of Myrtle Beach is the most beautiful section, the Waccamaw River where there are Spanish moss laden trees, no developments and pristine waterways. Photos of the past three days. This stretch is due WEST all day long! Oh, just what dolphins want….jet skis chasing them! Docked at Harborwalk Marina. 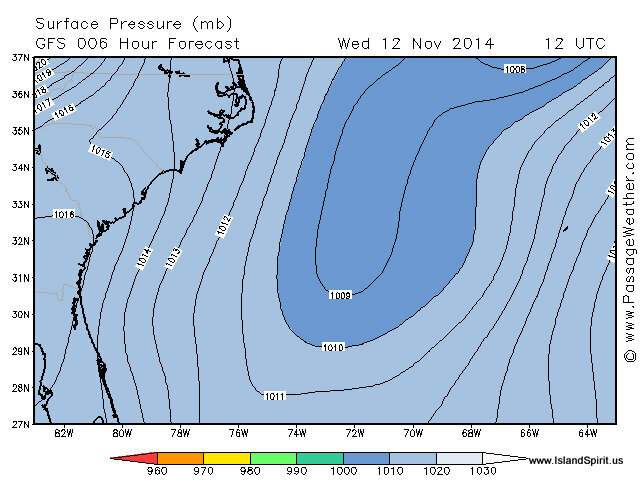 Waiting out gale force winds, Fri/Sat/Sun? and May back to Chesapeake Bay.